Indipenned aims to transform the publishing industry. For too long the books we have selected to read have been influenced by the big publishing companies and the size of their marketing budgets. These organisations determine what genres and books we should be reading based on what they think they can sell, which in turn is usually based on what they have already sold. This is by no means a disaster and it doesn't mean that good books don't get into the hands of appreciative readers, however the possibility remains that less formulaic and more imaginative literature is not getting the exposure and recognition it deserves. Maybe we’re being a little bit crazy, but we don’t think that the books people are reading should correlate to the amount spent advertising them. Here at Indipenned we have a vision of the future where the world of literature is, at least for some people, is a little different. We imagine an alternative reality in which the lovers of good books are more akin to wolves than sheep. Indipenned is about empowering readers and encouraging them to share all that is good in the world of independent literature. The basic idea is to make the choice of books we read more of a meritocracy and less about the deep pockets of publishing company executives. If you are a lover of great books and would like to join us on our journey, please take some time to take a look around our website. If we are to realise our vision, we need the support of the army of independent authors who, without the hindrance of the big five publishing companies, are publishing some excellently written books everyday. If you are an author of a great independently-written book then please register and upload your book now. There is no charge to list your books and in return we will work to give your writing the exposure it deserves. Indipenned actively promotes indie literature on both this website and across it’s various social network presences. We are not the only ones to make use of social networks to promote the work of independent writers. There are many who do this and it’s not for us to question the effectiveness of tweeting a book to a zillion Twitter followers, however the difference with us is that we never charge a fee. Our wages get paid when the books you list in our bookshop are sold. Deliver a portal for book lovers that gives them access to the some of the most exciting authors and the excellent independently-written literature they may otherwise be unaware of. 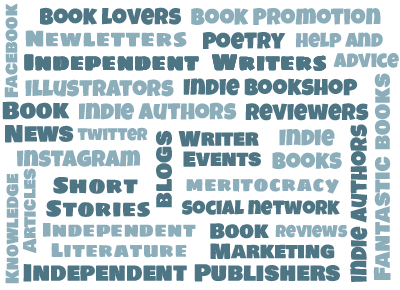 Help the writers of independent literature to produce the best books they can by providing a platform for them to collaborate and share their knowledge and experience of writing, book production and marketing. Use a merit-based system to determine the prominence in which books are listed on our website in order that the cream floats to the top. This is done using a secret algorithm that we are very proud of. Note we also used the featured books section of our home page to give a little boost to the books of those writers who are helping us by actively engaging with our site and posting short stories, blogs, events and the like. Work to promote independently-written literature across our social network presences free of charge. Provide a low cost, subscription free platform for independent writers that only takes a fee when a book is sold, in order that writers get the best possible return for their hard-won book sales. If you would like to help us revolutionise the world of publishing register now.